Squamish (/ˈskwɔːmɪʃ/; 2016 census population 19,512) is a community and a district municipality in the Canadian province of British Columbia, located at the north end of Howe Sound on the Sea to Sky Highway. The population of the Squamish census agglomeration – including First Nation reserves of the Squamish Nation not governed by the municipality – is 19,893. The town of Squamish had its beginning during the construction of the Pacific Great Eastern Railway in the 1910s. It was the first southern terminus of that railway (now a part of CN). The town remains important in the operations of the line and also the port. Forestry has traditionally been the main industry in the area, and the town's largest employer was the pulp mill operated by Western Forest Products. However, Western's operations in Squamish permanently ceased on January 26, 2006. Before the pulp mill, the town's largest employer had been International Forest Products (Interfor) with its sawmill and logging operation, but it closed a few years prior to the pulp mill's closing. In recent years, Squamish has become popular with Vancouver and Whistler residents' escaping the increased cost of living in those places, both less than one hour away by highway. Tourism is an increasingly important part of the town's economy, with an emphasis on outdoor recreation. The Squamish people are an indigenous people whose homeland includes the present day area of Squamish, British Columbia. 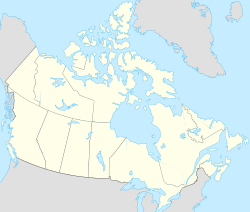 They have inhabited an area of southwestern British Columbia that includes North and West Vancouver, Howe Sound, Whistler, the areas surrounding the tributaries entering Howe Sound, Burrard Inlet, and English Bay. The word Squamish derives from the name of the people which in their language is Sḵwx̱wú7mesh. The people reside primarily on a number of Indian Reserves owned and managed by the Squamish Nation in the Squamish Valley area. A few places and names in the Squamish area derive from Squamish language words and names. Ch’iyáḵmesh is the name of an old village that was located on the Cheakamus River. St’á7mes is a community located near the south entrance to the town of Squamish, which lies below the Stawamus Chief, which gets its name from that village. Mámx̱wem is where the Mamquam River name comes from as well. Squamish territory comprises 6,732 km², though lands controlled by the Squamish Nation band government are relatively scarce, and on Indian reserves only, though the Squamish Nation must be, like other native governments, consulted on developments within their people's territory. Residents of Indian Reserves are not governed by the District of Squamish but by the Squamish Nation. The Squamish Nation's population and Indian Reserves also include villages in North Vancouver and a number of other reserves at Gibsons and elsewhere in the general region. The name Keh Kait was the traditional name for the site of downtown Squamish. The current mayor of Squamish is Patricia Heintzman, who won the 2014 election. Previous mayors have included Rob Kirkham (2011-2014); Greg Gardner (2008-2011); Ian Sutherland (2002–2008) among others. Current council members are Doug Race, Jason Blackman-Wulff, Karen Elliott, Peter Kent, Susan Chapelle, and Ted Prior. 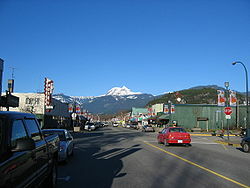 The municipality is part of the Squamish-Lillooet Regional District. On the provincial level, Squamish is in the West Vancouver-Sea to Sky electoral district. The MLA is Jordan Sturdy (BC Liberal). He was elected in the 2013 provincial election after his predecessor, Joan McIntyre, also of the British Columbia Liberal Party, retired from politics. Sturdy was the sitting mayor of the town of Pemberton at the time of his election to the British Columbia Legislature. He was re-elected in the 2017 provincial election and appointed the critic for Transportation and Infrastructure. Federally, Squamish is a part of the West Vancouver—Sunshine Coast—Sea to Sky Country electoral district. It is represented by Pamela Goldsmith-Jones of the Liberal Party, who took office after Canada's 2015 federal election. Squamish has five English public elementary schools: Brackendale Elementary, Garibaldi Highlands Elementary, Mamquam Elementary, Squamish Elementary, and Valleycliffe Elementary. Under the Sea to Sky Learning Connections, the public schools district also manages Sea to Sky Online, Seat to Sky Alternative, Cultural Journeys, and Learning Expeditions. The Conseil scolaire francophone de la Colombie-Britannique operates one Francophone primary school in that city: the école Les Aiglons. There are two public secondary schools – Howe Sound Secondary School and Don Ross Secondary School – as well as the board office for School District 48 Howe Sound. Squamish hosts three private schools: Squamish Montessori Elementary School, Cedar Valley Waldorf School, and Coast Mountain Academy for grades 7 through 12. Coast Mountain Academy is located in the campus of Quest University. Capilano University offers post-secondary education through its Squamish campus, including diploma programs and university transfer courses. Quest University, which opened in September 2007, is Canada's first private, non-profit, secular university. Squamish is home to a variety of faiths. There are eleven churches and religious organizations, including several Christian denominations, as well as the Bahá'í Faith, and a Sikh temple. The Squamish Public Library is located in the downtown area on Second Avenue. The library houses a collection of books, CDs,DVDs, and magazines. It has an Art for Loan collection and an online historical archive of various photographs, periodicals, and other items. Nearby museums include the Britannia Mine Museum and the West Coast Railway Association. In 1998, Squamish was briefly the home of the world's first unionized McDonald's franchise, although the union was decertified by the summer of 1999. Every year, Squamish hosts the popular Squamish Valley Music Festival, though they did not proceed with the festival in 2016. Usually taking place in August, the festival has hosted artists such as Eminem, Bruno Mars, Macklemore and Arcade Fire. Squamish has been a filming location for a number of media works. Examples include the films Insomnia (2002 film), Walking Tall (2004 film), Chaos Theory (2008), Star Trek Beyond (2016), the television series Men In Trees, The Guard, A&E's U.S. adaptation of The Returned, the Hallmark Channel's Aurora Teagarden mysteries, and Netflix's Lost in Space reboot. Squamish is one of the wettest inhabited locations in Canada, with over 2,200 millimetres (87 in) of rainfall per year, often falling in long stretches through the winter. Public transportation is provided by the Squamish Transit System; this service is free over the summer to students at school age (elementary and secondary). Daily bus service to Vancouver and YVR Vancouver Airport is provided by YVR Skylynx with multiple departures every day. Grimes, musician; lived in Squamish while recording her fourth studio album, Art Angels. ^ Statistics Canada. Squamish District Municipality Census Profile, 2016 Census – 100% data Retrieved on: July 22, 2017. ^ Statistics Canada. Squamish Census Agglomeration Profile, 2016 Census – 100% data Retrieved on: July 22, 2017. ^ Western Forest Products Western Forest Products Announces Q1 2006 Results/Strategic Acquisitions Closed. Press Release, May 12, 2006. retrieved on: July 30, 2007. 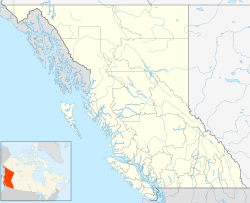 ^ "Squamish (district municipality)". BC Geographical Names. ^ Squamish Bouldering, 2nd Edition, Quickdraw Publications, 2010, ISBN 978-0-9732593-7-7. ^ "About | MLA Jordan Sturdy". jordansturdymla.ca. Retrieved 2018-08-07. ^ Millar, Erin (22 October 2012). "The great experiment: Quest University's radical step in higher education". The Globe and Mail. Retrieved 15 November 2012. ^ "McDonald's workers decertify union". CBC News. Canada. ^ "Census Profile, 2016 Census". 2.statcan.gc.ca. 2017-11-29. Retrieved 2018-07-24. ^ "Aboriginal population". 2.statcan.ca. 2010-10-06. Retrieved 2017-11-29. ^ "Canadian Climate Normals 1981-2010 Station Data". Environment Canada. Retrieved October 18, 2015. ^ Government of Canada, Foreign Affairs Trade and Development Canada. "List of Canada-Japan Sister and Friendship Cities". Retrieved 2017-02-05. Wikimedia Commons has media related to Squamish, British Columbia. Wikivoyage has a travel guide for Squamish.